If you can't take in an official Fashion Week event, you can still revel in the work of one of New York City's inventive (and rock 'n' roll-related) designers at the Audio Visual Arts gallery. Christian Joy's first solo exhibition, "The Visitors Must Be Amused," features eight different pieces constructed with materials leftover and left out of her work from the past nine years. 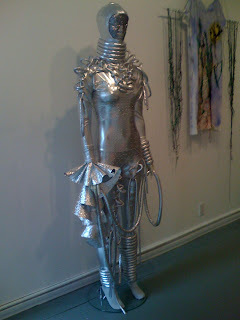 Joy invited her friends and family to compose a description of a 'female being', which she used to design the looks before each contributor incorporated their costume into a photograph, drawing, or image for display. "She had been born under a dead sea. Carved and polished by the dense saline tide, her mouth took on the landscape of the coral graves on which she slept..."
Nick Zinner's piece looks like a lycra bat-creature, called "Ghost With Boo Sign," while some of the others featured include a silver glam rock alien jumpsuit covered in ruffles and coils, as well as a little black dress - cubism style. "The Visitors Must Be Amused" is more constructed than de-constructed, and while some pieces are more intriguing than others, the exhibit gives insight into process, collaboration, and inspiration as experienced by one indie fashion designer in NYC. You'll be more than amused. Free! Now through March 8. Blacklist - "Flight of the Demoiselles"
Hello Kitty + MAC + "the dark side"